The best way to conquer your neighbor's hearts is to give them some of your hard-earned bounty. 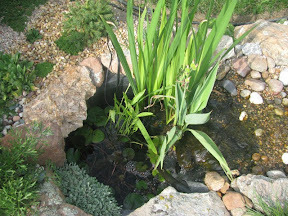 This is my pond at the bottom of the waterfall rock garden. I can tell you before I even started this project, I had a vision. My vision was for a dry river bed with a copper basin at the bottom. I had designed the scree bed with a cut-out in it on this end or side just for this purpose. Knowing that in a couple of years I would be completing this project. Over time my brain transitioned and when I started working the soil after its delivery, I knew it was to be a small pond with a real flowing waterfall. It is small. I didn't want a huge one due to the maintenance and the area I was working with. All of my gardens installed have been completed within the confines of the existing beds-from previous owners. So far it has worked out just fabulous. I have been able to accomplish all I have wanted, thus far. Even though it is small, I just love it. At times I wish I had something larger so I could add more plants, have fish, and have a contoured bottom for variety. Perhaps someday in the back. Last night I decided it was time to divide my pond plants. For several reasons. First, the iris didn't bloom very well. Probably because they had become so cramped the pot was no longer round. and I am visiting my parents' tomorrow for a family reunion. They live about an hour-and-a-half north of Denver, so I wanted to be able to share my bounty with them. They installed a pond in their front courtyard last year. And it feels so good to be able to share what comes so naturally for me. 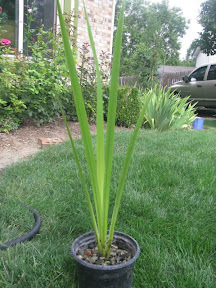 I currently have an iris, a canna, a water lily, and another plant whose name escapes me now. I have the tags, so sometime soon I will upload my planting lists. The picture above was taken yesterday. 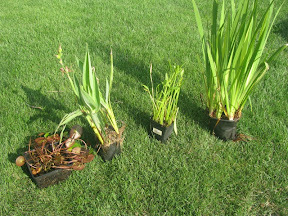 So here are the plants freshly pulled from their safe haven in the pond. This area is typically used for my small veggie garden. I have left it allow this season. Not really on purpose, just one of those this that hasn't happened. At any rate, made a perfect repotting station. I turned over some of the regular garden soil. 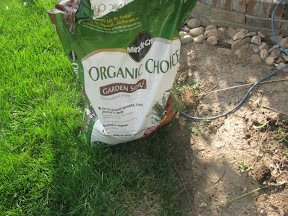 I handed a few handfuls of organic compost and turned it over to blend it in. I did re-use a couple of my pots, I bought some new strainer type pond pots, and I brought some recycled planting pots home from work. 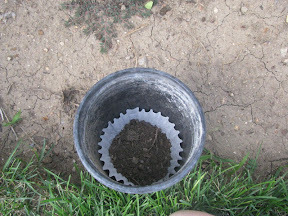 I placed a coffee filter in the bottom and filled with soil. The coffee filter does help Prevent the movement of the media out of the pot, causing it to foul the pond. 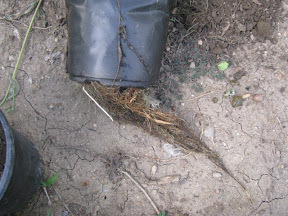 Roots were growing everywhere. Even into my filter in the bottom of the pond. 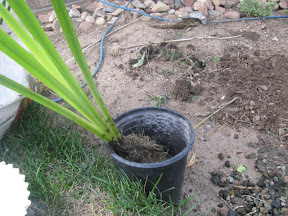 I pruned these roots off and cut the pot to expose the plant. I gently pruned some of the roots off the bottom of the plant. This is a good time of year to do this because in Colorado they still have about two to three months to re-establish more. I didn't remove more than about three inches off the bottom. 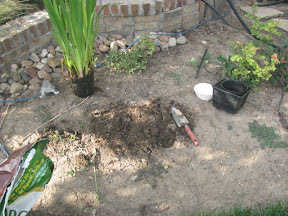 I cover the soil with my recycled gravel and some new pea gravel and pat into place. Finished off by dousing with water to allow some initial settling. I had three of the four plants I started with in need of division. It couldn't have worked out better. By the time I was done I had three of each- a set of three for my parents, a set of three for myself to put back into my pond, and a set of three to give to my neighbors for their pond. A small thank you for allowing me to recycle some crushed granite into their side driveway. They weren't home at the time but had some little pretties at their garage door when they returned home last night. They loved them. And it felt good. I completed a project in my garden in need of completion and I was able to share what I had with a few people. Pretty garden Heather. I do hope the plants that you gave do as well.